My very dear friend and Cleveland Heights biking colleague, Lisa DiFilippis, died this past April after a three-year long battle against ovarian cancer. I am riding this year to keep a promise I made to her and in celebration of her life and our wonderful rides together over many, many years. 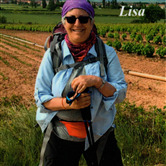 Please make a generous pledge in memory of Lisa and then get on your bike and take a ride. You’ll feel great when you do.